I want to thank you all for your kind words, your prayers and that powerful energy you sent my way. It truly does make a difference. Because we all need a laugh! I believe like many of you do, that when one door closes, another opens. But when it’s me that’s standing in that hallway, I need you to remind me of what I believe. I am breathing. I am reminding myself to not fight, but to go with the flow. That all things happen for a reason, including this. Last night I thought about our current circumstances, and made some decisions about some things. I decided that it’s time to make some changes. Keep that positive energy flowing my way as I move forward. Rumpy is in the running for Mr. World Spay Day 2013. Thirty of you voted for him yesterday. To you I give a big hearty thank you. Recent studies have shown that one of the BEST determinants of responsible pet ownership is in providing needed medical care. We all know that spaying of companion animals is important. But did you know that most low-cost spay/neuter programs do so much more? They provide needed vaccinations if the animal has not yet had them. They offer counseling to the caretaker on how to most responsibly care for that animal, including recommendations regarding veterinary care. In other words, if we can get people and their pets into the door of a low-cost spay/neuter clinic, the likelihood they will continue to be responsible in caring for that animal increases exponentially. We NEED to promote this vital service all around the world. And as more people become proactive in the care of their companion animals, I believe they will also become more proactive in the care of ALL animals. So I ask you to please help me spread this message to others by voting and by asking your friends to do so as well. It’s not about Rumpy winning. It’s about ALL animals winning. You are wonderful Nia!!! Thank you! Good luck with the job hunt. Thank you for doing this promotion … and big smiles for Rumpy in curlers. Isn’t that just the best???? it is. How’d you do it? When one door closes another one opens. That how I try to look at things. I hope everything works out for you. Now, how on earth did you get Rumpy to pose for that picture – I love it. Guppy made that with a photo shop app!!! You would be a terrific and positive asset to any company that would have you! Prayers for your future position! Thank you so much Maria! It’s much easier to be confident in myself when there are other good folks like you that are confident in me. I hope all things will fall into place. I like your hair styling – how does it look if the curlers are removed? Like an alaskan poodlemute? OMD! How did your fur look after the curlers??? Sometimes making the decision to change directions is more difficult than the change itself. I hope that holds true for you. It has for me. May you find that place in your world that brings you great success combined with happiness and fulfillment. Murphy and I love the curlers. Woofs n wags! Great attitude Rumpy (Jen) – you all are going to be fine. Wow, what a lot of courage it takes to get a shock and follow it up with taking a deep breath and making a hard decision. I’m impressed and awed by your fortitude. There are many places that would be blessed to have your creativity and smarts. I wish you good luck in finding the right match. It seems to me that once I face I problem, I find that what I thought was bothering me isn’t the problem after all. Hang in there and try to keep your spirits up. Among all the other things, that can be the hardest to do. We’re all pulling for you. I believe it will. Thank you! *hugs* good luck on your journey to find another job. Too bad you can’t move down to the Tampa bay area where I am, there are a lot of houses for rent and there are some jobs as well. Whatever you decide, I’m sending positive thoughts to you. we are not opposed to Tampa. I will look online and see what’s available that might fit! Thank you! 🙂 It’s an excuse to get some animal friends to move closer.. 😉 I just don’t know what you do for a living because it may not be a good fit. I’m very sorry about what’s been happning to your family, Rumpy. I’ll continue to send powerful energy and lots of prayers to Jen and your family. I totally agree with you asking of the importance of spay/neuter, Rumpy. I shared it on my FB already and am very pleased to do so. I hope it all works out for the best. Getting Bob to share this on his group page at FB. Being a cat the rollers (like a lot of things) frightened him a bit so he asked me to let you know that he is very supportive as the both of us usually are. Meanwhile, Winston is playing with a bug. Voted again today Rumps. Be of good spirits, God provides, not always what we want, but what we need. Love ya’ll. Good luck in the competition you beautiful dog!! And lots of strength for your family. What you stand for is incredibly important, it helps so many animals all across the globe. Hope you win, and I’m sorry about all the stress you’re going through right now. Haha, Rumpy! I tried curlers in my tail hairs….I hope yours came out better than mine! Pee Ess: I voted again!! That’s the Spirit.. when life gives you LEMONS… Think LEMONAIDE!!! Way to stay positive! And if you ever need a smile, I think that photo of Rumpy in curlers will do the trick! Works like a charm for me. Good Luck Rumpy! 152 votes so far! Rumpy, and family, as you go through this difficult time Cayman & I wish for you to have peace and happiness, always. I just know good things will head your way! Murphy and I will continue to vote every day!! And while it sounds like you’re going through a rough patch right now, I truly believe something better will be on the horizon! Voted for Rumpy! Try to keep yourself in as peaceful mood, as possible. Sometimes opportunity speaks in a quiet voice. But, when you hear it and know it is right – everything will fall into place! (a) that photo is utterly hilarious! Our daily vote is in. Your message is an important one. I know this well. I had 3 puppies before Mom found me. I don’t know what happened to them, and for a long time, I didn’t know what was going to happen to me! Thank you so much for your support Cupcake! Love the photo Rumpy… Your post title reminded me of an old manager. She lived by those words I think. I’m off to vote for Mr. Rumpy again today! Rumpy, you are a poster child for companion dogs. Photoshop or not, it did give me food laugh. Good luck. I hope you win. (i voted for you yesterday.) The cause is so important. I low income communities. If dogs are not spayed or neutered, the population increases where people don’t have the funds to care for the explosion. Thanks for your vote. you can vote every day! Rumpy, dogs are the best – that’s a great picture. Houston had a no cost spay/neuter program today with lots showing up. It’s so important. I’ve passed contest link to my friends who Facebook. Will try to think up a post to highlight your efforts – you are the champ! Paws all crossed that Jen will discover a wonderful opportunity soon. (Even RC is meditating on it). Hugs and soft cheek pats to all. Not sure what is going on but sending lots of positive vibes! I love, love that photo of you Rumpy, with your “do” in curlers. But you know what I love even more? The way your human advocates so passionately for our animal companions. You both rock! many good vibes being sent your way. Never lose your hope and faith!! God is with you!! 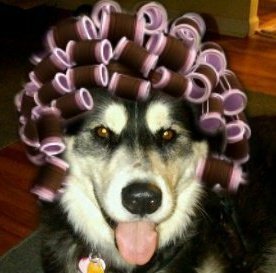 you might look fetching… but the human that put those curlers in your fur might be looking a bit rough after the experience! woo woo! Thanks so much for your votes! I hear echos of myself here…when the house repossession was being battled. No matter what good advice you can offer others its totally different when its you. It can be scary at times, a bit overwhelming on occasion and most of the time a very lonely path via ultimately despite any support you’re walking it alone. Fighting for positivity as you are in making decisions and making definite changes helps a lot – I find it gives back some much needed sense of having a modicum of control over your life – important because these situations can in your darker moments create a depressing and destructive sense of helplessness…and you’re not! You have to walk thru the darkness for a little while to see the welcoming light of relief and new found security on the other side. Thank you. It is true that it can be a lonely journey. But I don’t feel alone. And this will eventually pass. You are such a positive force. Keeping you lifted up.